So, again it’s being a while since I blogged. Dare I say I am back on track and intend to be back on WordPress more often? I was having a mini cupboard sort out (that’s a mini sort out, not a sort out of a mini cupboard!) and found these little star quilted patches. I put them together, added the long strips either side then ran out of steam …. I think when I made them (a few years ago now), as well as having a play with fabric and a new craft book, I thought I would make a quilt. Ha ha ha, say those who know me, rolling their eyes skyward. Another over ambitious project. 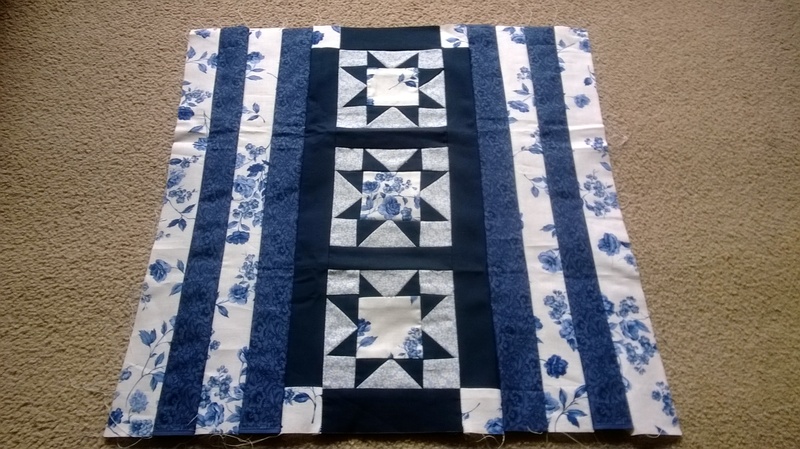 I absolutely love blues and whites together so this time I thought maybe ‘a cushion cover’, then realize i do not have a space in a room where blue and white would be shown off to effect. I am now thinking of either a knitting needle case, making sure the stars are uppermost so I can see them every time I go into my craft room or maybe a sewing machine cover. I am learning not be over ambitious with my crafting. I may have many projects but none are large and many are portable. In the last month my crocheted granny square blanket has grown, though the aran wool is warm to work with so that has been put aside in favour of a DROPs cotton shrug or wrap – I say either as it is being created as I work on it. For non knitters that may sound weird, but there may be other knitters who will understand! It began as a tunic top, though working from a girls pattern rather than a ladies, despite sizing it upwards, it has not grown enough and I know it will not fit me as a tunic top. 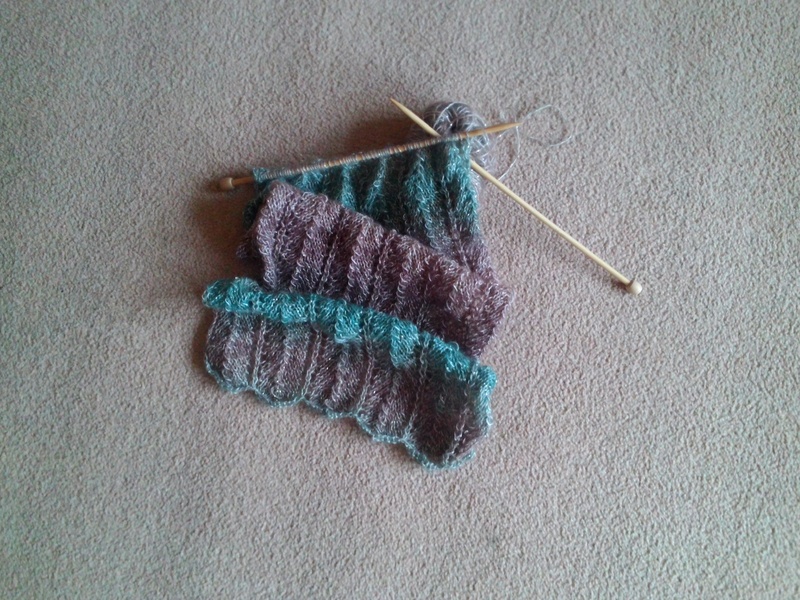 I love the colours – teal, raspberry and lime green (sounds ghastly, watch this space!) and I will not rip it back, so I shall get to a certain point and decide what it will eventually become. I have also nearly finished a fabric summer top. You see, I have been busy making rather than blogging! I have also been getting stuck into a new ‘real’ job, travelling up to London three days a week. I knit or crochet on the train and bus, get a few strange looks along the way, and have only been approached with interest once! I don’t think there are many fellow travelers around my way who craft or maybe there WIPs are too big to bring along! Who knows?! This entry was posted in Uncategorized and tagged commuter, crochet, knit, quilt, train, tunic.